1. Take a very sharp knife and score the pork skin into parallel lines about a centimeter apart, which means attempting the slightly awkward process of cutting into the skin deep enough to reach the fat but not so deep to cut into the meat. It feels sort of wrong, but it will make you happy in about six hours when you have crackling in hand. 2. 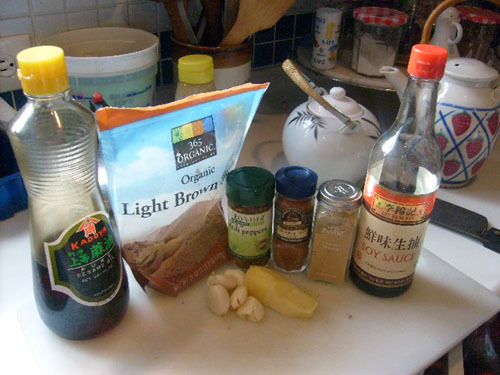 Dice the garlic and ginger and mix with the spices and liquids to form a chunky paste. I did this by hand, but even better if you’ve got a mortar and pestle. 3. 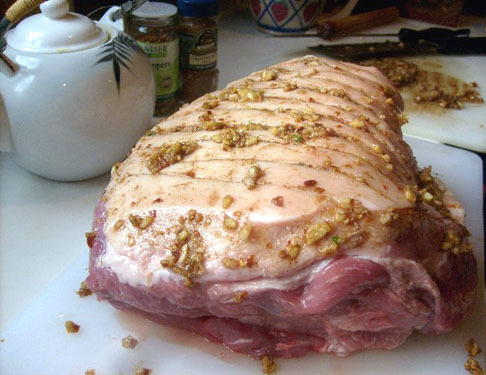 Give the skin side of the pork a nice deep tissue massage with half of the tasty paste, then place it skin-side up on a rack in a roasting tray. Then you can make tasty gravy with the meat juices below. Blast the meat for half an hour at 450º. 4. After what Hugh F-W calls the ‘half-hour sizzle’, grab a pair of oven mitts and flip over the shoulder. If you have the ability, it is particularly amusing to make your little sister stand by the oven holding the scorchingly hot hunk of heavy meat while you do something, I can’t remember what. Once you allow her to put the meat back in the tray upside down, rub the other side with the rest of the, um, rub. In case you have no common sense, I will remind you not to do this with your bare hands and to use a wooden spoon instead. 5. Pour a glass of water into the roasting tray, bring the temperature down to 300º and leave the meat to slowly increase in tastiness for about six hours. Adjust temperature accordingly depending on how much time you have – Hugh F-W does 16-24 hours at 110º, I increased the heat because I only had 6 hours instead of overnight. If you’re not sure, just make sure the internal temp is at least 165º before pulling the shoulder from the oven. Regardless of cooking time, flip and baste the meat halfway through. 6. 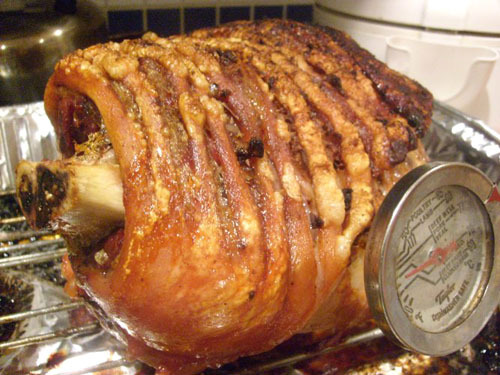 About 45 minutes before you’re ready to eat, turn the heat back up to 450º to get your crackling all crispety crunchety. 7. When the meat is done and cooling, you can make a quick and meaty gravy by heating some of the pork fat from the roasting tray and whisking with a few shakes of flour to make a roux. Then pour in the rest of the pan drippings, stock, some soy sauce, a bit of chili sauce, some red wine, whatever you’ve got around that tastes good. The sauce will thicken and become awesome. why don’t i eat pork again? that is an excellent question. one that you may want to consider reconsidering. Most of my family was snowed in up in the Twin Cities, but Mom and I LOVED your pork shoulder at our Christmas dinner. Plenty of left overs for when the family does arrive!